A tale of self-sacrifice and selflessness. Odin, the Allfather, sat one day on his high air-throne, and looking around him, far and wide, saw three fierce monsters. They were the children of the mischievous fire-god Loki, and Odin began to feel anxious, for they had grown so fast and were getting so strong that he feared they might do harm to the sacred city of Asgard. The wise father knew Loki had given strength to these dreadful creatures, and he saw that all this danger had come upon the Æsir from Loki’s wickedness. One of these monsters was a huge serpent, that Odin sent down into the ocean, where he grew so fast that his body was coiled around the whole world, and his tail grew into his own mouth. He was called the Midgard serpent. The second monster was sent to Niflheim, the home of darkness, and shut up there. The third, a fierce wolf, named Fenrir, was brought to Asgard, where Odin hoped he might be tamed by living among the Æsir, and seeing their good deeds, and hearing their kind words; but he grew more and more fierce, until only one of all the gods dared to feed him. This was the brave god, Tyr. He was a war-god, like Thor, and is sometimes called the Sword-god. Tyr was loved by all because he was so true and faithful. Each day the dreadful wolf grew larger and stronger, till all at once, before the Æsir thought about it, he had become a very dangerous beast. Father Odin always looked troubled when he saw Fenrir, the wolf, come to get his evening meal of meat from Tyr’s hand, and at last one night, after the wolf had gone growling away to his lair, Odin called a meeting of the Æsir. He told them of his fears, saying they must find some plan for guarding themselves and their home against this monster. They could not slay him, for no one must ever be killed, and no blood must be shed, within the walls of the sacred city. When the Æsir heard these words of Thor, they were glad, and all went home rejoicing—all save the Allfather, who was still troubled, for he well knew the danger, and feared that even the mighty Thor would find this task too much for him. But Thor seized his hammer, and strode off to his forge. There he worked the whole night long, and all through Asgard were heard the blows of Miölnir and the roaring of the bellows. The next night, when the Æsir were gathered together, Thor brought forth his new-made chain, to test it. In came Fenrir, the wolf, and everyone was surprised to see how willingly he let himself be bound with the chain. When Thor had riveted the last links together, the gods smiled, and began to praise him for his wonderful work; but all at once the wolf gave one bound forward, broke the great chain, and walked off to his lair as if nothing had happened. Thor was much disappointed, still he did not lose courage. He said to the Æsir that he would make another chain, yet stronger. Again he set to work, and for three nights and three days the great Thor worked at his forge without resting. While he worked his friends did not forget him. They came and looked on while he was busy, and, as they watched the mighty hammer falling with quick blows upon the metal, they talked to Thor or sang noble songs to cheer him; sometimes they brought him food and drink. One visitor, who was no friend, fierce Fenrir, the wolf, sometimes put his nose in at the door for a moment, and watched Thor at work; then, as he went away, Thor heard a strange sound like a wicked laugh. At last the chain was finished, and Thor dragged it to the place of meeting. It was so heavy that even the mighty Thor could hardly lift it, or drag it as far as Odin’s palace of Gladsheim. 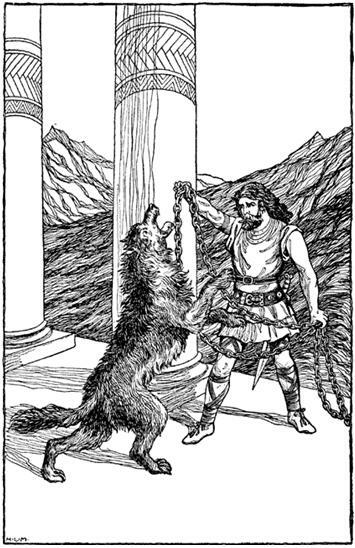 This time Fenrir was not so willing to be bound; but the gods coaxed him, and talked of his great strength, and told him they were sure he would easily break this chain also. After a while he agreed to let them put it around his neck. This time Thor was sure the chain would hold firm, for never before had such a strong one been made. But soon, with a great shake and a fierce bound, the wolf broke away, and went off to his lair, snarling and showing his wicked teeth, while the broken chain lay on the ground. Sadly the Æsir came together that night in Odin’s palace, and this time Thor was not the first to speak; he sat apart and was silent. The Allfather’s troubled face grew brighter as he heard Frey speak, and he bade him send a messenger quickly to the dwarfs, to order a chain made as soon as possible. So Frey went out, leaving the Æsir in their trouble, and came to his own lovely home, Alfheim. There everything was bright and peaceful, and the little elves were busy and happy. Frey found a trusty messenger, and sent him with all speed to the dwarfs underground, to order the new chain, and to return as soon as he could bring it. The faithful servant found the funny little dwarf workmen all busy in their dark rock chambers, far down inside the earth, while at one side, in a lighter place, sat their king. The messenger bowed before him, and told him his errand. The dwarfs were a wicked race, but they were afraid of Odin, for they had not forgotten the talk he once had with them, when he sent them down to work in darkness underground, and since that time they never had dared disobey him. The dwarf king said it would take two days and two nights to make the chain, but it would be so strong that no one could break it. While the busy dwarfs were at work, the messenger looked about at the many wonderful things: the great central fire which burns always in the middle of the earth, watched and fed with coal by the dwarfs; above this, the beds of coal, and bright precious diamonds, which the dwarfs took from the ashes of the fire. In another place he watched them putting gold and silver, tin and copper, into the cracks in the rocks, and he drank of the pure, underground water, which gives the Midgard people fresh springs. Odin’s messenger was glad to hear this, so he thanked the dwarf king, and promising him a large reward, he went on his way back to Asgard, where the Æsir were longing for his return, and were all rejoiced to see him with the magic chain. Now Father Odin feared that Fenrir would not let them bind him a third time, so he proposed they should all take a holiday, and go out to a beautiful lake to the north of Asgard, where they would have games and trials of strength. The other gods were pleased with this plan, and all set out in Frey’s wonderful ship, which was large enough to hold all the Æsir with their horses, and yet could be folded up small enough to go in one’s pocket. Now the wolf did not want to be bound again; but he was very proud of his strength, and, for fear of being called a coward, said at last he would let them do it, if he might hold the right hand of one of the Æsir in his mouth while they bound him, as a sign that the gods did not mean to play any tricks. When the gods heard this, they looked at each other, and all but one of them drew back. Only the brave, good Tyr stepping forward, quietly put his hand into Fenrir’s mouth. The other gods then put the chain around the beast, and fastened it to a great rock. The fierce creature gave a leap to free himself, but the more he struggled the tighter grew the chain. The Æsir gathered about him in joy to see this, but their hearts were filled with sorrow when they saw that their noble Tyr had lost his right hand; the dreadful wolf had shut his teeth together in his rage, when he found he could not get free. Thus the brave Tyr dared to risk danger for the sake of saving others, and gave up even his right hand to gain peace and happiness for Asgard. It is a wonderful story, but I am wondering if this is taken from one of Snorri Sturlson’s eddas or is it an oral tradition that was written down and translated? The stories in this volume were indeed selected from a number of previously published volumes like Thorpe’s translation of Sæmund’s “Edda”; “The Younger Edda,” in translations; Anderson’s “Norse Mythology”; Guerber’s “Myths of Northern Lands”; William and Mary Howitt’s “Literature and Romance of Northern Europe”; and Mallet’s “Northern Antiquities.” etc. I guess all similar tales were once orally passed on until written doen, probably in Norwegian, before being translated into English. Many of the translations occurred during the late 1800’s.